Pogba was born in Lagny-sur-Marne, Seine-et-Merne, France to Guinean parents on March 15, 1993. Guinea is a country located in West Africa. Paul Pogba is Muslim and has two twin brothers that are also footballers. The path Paul Pogba took to become the world’s most expensive footballer is filled with risk, shock and class on the pitch. We many never hear a story like this again, the moves Pogba made were highly criticized and it doesn’t seem like he is done shocking the football world. His football career began at six years old, playing for US Roissy-en-Brie, just a few miles away from his home. He played seven seasons at the club before joining US Torcy, where he was captain of the club’s 13 and under team. After just one season with US Torcy, Pogba joined the professional club Le Havre. At this time Pogba had established himself on the youth national team for France. His performances at the club level and internationally led to lots of interest from top clubs like Arsenal and Juventus. In July 2009, Paul Poga announced that he was leaving Le Havre to join Manchester United’s youth academy in England. Le Havre was surprised by his move and alleged they had a “non-solication agreement” with Pogba, which was agreed by Paul and his parents in 2006. Le Havre went on to release a statement criticizing Manchester United and the Pogba family. Pogba transfered to Manchester United in October 2009 and made his debut with the club’s 18 and under team against Crewe Alexandra in the same month. He completed the season with seven goals in 21 appearances. On February 2011, Pogba was one out of four academy players called into the first-team squad by Alex Ferguson. He was given the number 42 shirt. He then continued with the under 18s, helping the team win their tenth Youth Cup title. At the start of the 2011-12 season, Alex Ferguson confirmed that Pogba would be featuring with the senior team during the season. Pogba was promoted to the club’s reserve team permanently for the 2011–12 season and made his first appearance of the season in the team’s opening Premier Reserve League match against Arsenal. On July 3, 2012, Manchester United confirmed that Pogba had left the club after not signing a new contract. Alex Ferguson stated that Pogba had signed for Italian club Juventus “a long time ago as far as we’re aware.” Ferguson also accused Pogba of disrespecting Manchester United. Pogba’s first competitive appearance with Juventus came in the Serie A match against Chievo on September 22, 2012, he played a full 90 minutes. On October 2nd, he made his first appearance in the UEFA Champions League in a 1-1 draw against Shakhtar Donetsk. 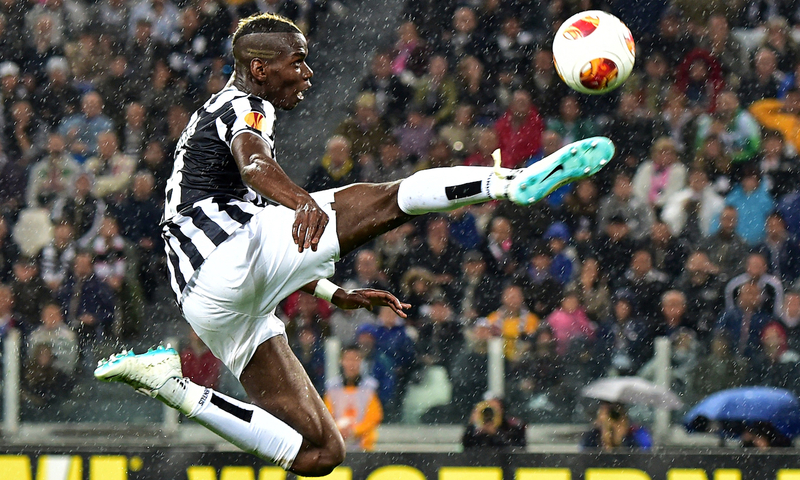 On October 20th Paul Pogba scored his first goal for the club in a 2-0 win over Napoli. In December, Pogba was named the 2013 Golden Boy an award for the best young player in Europe. In January 2014, Pogba was named by The Guardian as one of the ten most promising young players in Europe. Pogba scored his first UEFA club goal on February 20 against Trabzonspor in the first leg of the 2013-14 UEFA Europa League. On June 6, 2015, Pogba started for Juventus in the 2015 UEFA Champions League Final, they were defeated 3-1 by Barcelona at Berlin’s Olympiastadion. The transfer rumors started going crazy, Juventus then handed Pogba the prestigious number 10 shirt, worn by Carlos Tevez, Alessandro Del Piero, Roberto Baggio and Michel Platini. In the 2015-16 season, Pogba excelled in his team’s new creative position, which saw him gain more time on the ball, and played a key role in helping Juventus to the league title, scoring a joint personal best of 8 goals in Serie A, while also finishing the league as the top assist provider in Serie A, with a personal record of 12 assists, alongside Miralem Pjanić. This would be his final season as a Juventus player. When the Juventus season ended, the football world went wild again with rumors of Paul Pogba going to Barcelona, Manchester United or Real Madrid. Not a day went by without someone breaking down a Instagram post or a Twitter message. It seemed as if Pogba and his team were taking full advantage of the rumors, dropping hints almost daily as he traveled around the United States. Even American sports outlets started getting on the craze, all you heard for the entire summer was Pogba, Pogba, Pogba. Where would Paul Pogba end up? On August 8, 2016 Pogba returned to former club, Manchester United, on a five-year contract for an all-time record for highest football transfer fee at €105 million (£89.3 million) plus bonuses of €5 million, surpassing the former record holder Gareth Bale. Announced with a sick ad featuring UK Grime artist Stormzy. Paul Pogba was more than just a footballer, he was a brand. He let the world know that his football career was in his hands, he was in control of his destiny from the start. What better way to prove a point than a world record transfer fee back to the club that didn’t give you the chance you deserved? Is Massimo Allegri’s Time Up at AC Milan?